The 2500 block of South Mildred Street in Philadelphia. This one South Philly block saw one of the largest increases in the new property assessments, leaving residents perplexed. On the 2500 block of South Mildred Street, Eagles jerseys proudly hang outside aging rowhouses, and trails of litter zig-zag across the pavement. Windows bear colorful decorations celebrating Easter and spring — while outdoor furniture stands unused, waiting for warmer days. It could be any cozy old South Philadelphia block, frozen in time. Even as the Lower Moyamensing street evolved over years from a Jewish enclave into a vehicle for investors who brought in renters of all backgrounds, the block has remained stable, according to homeowners who have stayed, isolated from nearby periodic crime to the east, but far enough from a development wave spreading a mile north. So residents were shocked last week to learn that the 51 homes on the 2500 block of South Mildred nearly doubled in value overnight — on paper — as the city rolled out new property assessments for 2019. Tax bills for nearly half the block's homeowners will jump from around $1,000 to close to $2,000 or more. The sudden change left the mostly low- to middle-income residents who live along the block wondering: How could valuations change so much in just a year – especially before any vote on Mayor Kenney's proposed 4.1 property tax increase? Meanwhile, inside Philadelphia City Hall, it left City Council members questioning how exactly the process works — and how they can tell their residents that there will be a property-tax increase when many just got one from the assessments alone. "No one who lives here has hundreds of thousands of dollars coming in each month," said Maryann Filippello, 73, who has lived on South Mildred for just over five decades. "These are people who are on fixed incomes, Social Security … how do you pay gas, electric, telephone, home insurance, water … and then a [property-tax] increase? That's scary for me." Overall, the median market value of single-family homes increased 10.5 percent from the 2018 assessments, jumping from $112,800 to $124,600, according to an Inquirer and Daily News analysis of the city's data. The median tax bill would increase $165, excluding any homestead exemption or the effects of Kenney's proposed rate increase. But some individual homeowners could see two, three, or even 10 times that. And for renters, tax-bill increases could be passed onto them. The map shows changes in the median tax bill for single-family homes in Philadelphia neighborhoods from 2018 to 2019. Figures do not include any abatements, or the $30,000 homestead exemption available to all city homeowners, but also exclude Mayor Kenney’s proposed 4.1 percent property tax hike. Click and zoom in on the map for more information. Even though Philadelphia is the poorest big city in the country, one with troubled schools and an exploding opioid epidemic, it is in other ways a town on the rise, a millennial magnet with some fast-gentrifying neighborhoods and real estate bidding wars. According to the newspapers' analysis, the new assessments reflect both realities. In North Philadelphia, for example, where little real estate investment has occurred, several neighborhoods saw a decrease in assessed median market value for their single-family homes. Neighborhoods including Fairhill and East Germantown experienced the greatest declines, dropping 21.8 percent and 9.8 percent respectively. Overall, nine neighborhoods citywide saw the median market value of single-family homes either decrease or stay the same. 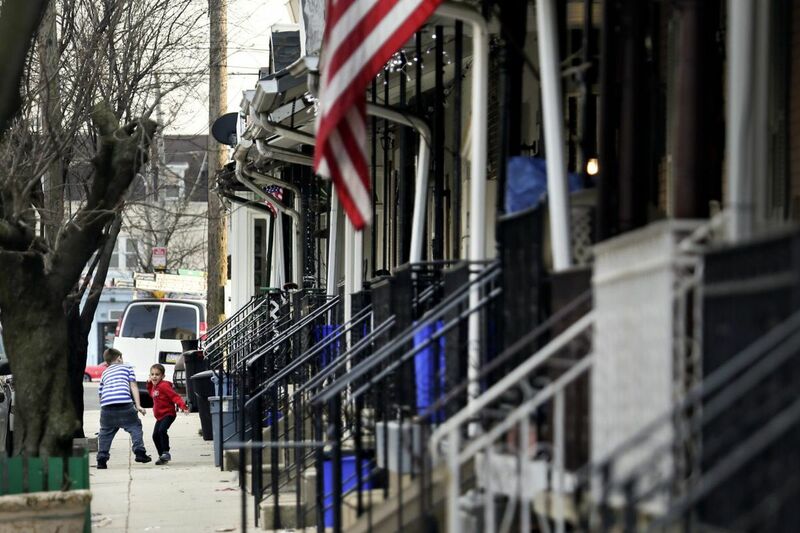 Forty-eight of Philadelphia's 57 neighborhoods saw jumps, with the "North Philadelphia/West" neighborhood — containing Brewerytown and Strawberry Mansion — spiking the most, increasing 47.1 percent, between 2018 and 2019. What is unusual about the 2500 block of South Mildred is that the median value of single-family property increased 85 percent, though the block hasn't seen any new construction or gentrification pressure. City assessors calculated the median house price on the block went from $76,800 to $142,100 in just a year. Filippello, a recent widow drawing from only a monthly Social Security check of around $1,100 per month and limited savings, said the 36 percent increase in her home's market value — raising her tax bill from an estimated $1,006 per year to $1,372, before any exemptions or rate increase — means cutting essential expenses from her budget. "It's gradual increases that you almost accept and expect," Filippello said. "Where are we supposed to go, the people who lived here, worked here, paid taxes here, and raised their children here? What happens to them?" In many ways, the jump in assessed value on blocks like Filippello's matches closely with independent analysis of recent sales trends nearby: Rowhouses on the block have been selling for between $87,000 to $149,9000 in the last two years, and the median price of a single-family home in the larger Lower Moyamensing neighborhood was $180,000 in 2017, according to a report by Kevin Gillen, a senior economic adviser at Houwzer LLC. In one of the centers of the city's real estate boom, nearly every neighborhood below South Street saw assessments spike more than 20 percent. "It's a tax increase without a rate increase and they want to do a rate increase," said Councilman Mark Squilla, who represents much of South Philadelphia, including Mildred Street, and the river wards. The city increased the market value of 30 rowhouses on one small block in South Philadelphia by at least 70 percent for 2019. The typical market value of a single-family home on the 2500 block of South Mildred Street grew from $76,800 in 2018 to $142,100 in 2019, an 85 percent increase. The median tax bill on the block will grow from $1,075 to $1,989 over the same time span. Figures do not include any abatements, or the $30,000 homestead exemption available to all city homeowners, but also exclude Mayor Kenney’s proposed 4.1 percent property tax hike. Councilman Allan Domb, a real estate broker who has advocated for an improved assessment system, said assessed market values should be gradually increasing 1 or 2 percent each year, preventing residents from enduring big shocks. "I'm not saying it's not warranted," Domb said about the increase in value across the city this year. "But instead, we're playing catch-up from previous years." City officials said the values simply follow market trends, as well as exterior inspections of a property's size and condition. Improvements and new construction also affect values. City chief assessment officer Michael Piper said that this round of assessments had "the most changes" since the 2014 introduction of the Actual Valuation Initiative (AVI), designed to peg assessments to the market rate. Since then, he said, the city has been correcting discrepancies in the post-AVI values and trying to keep up with the changing real estate market. Last year, the city focused largely on commercial properties, which saw large increases in their assessments. This year, residential properties have the largest increases. "It's always driven by the strength of the market," he said. "We don't know until we see the results of the research." Market values for all types of properties increased nearly 8 percent to $162 billion, city officials said. Similar to single-family homes, condos and apartments saw between 11 and 12 percent increases in market value, according to city-provided data. In contrast, commercial property saw hardly any change in overall value; office buildings saw a 7.5 percent increase in value. According to Piper, the city estimates that property values increase about 2 to 3 percent each year — though some years, like the most recent ones, perform better than expected, he said. To be sure, an analysis by Gillen of the single-family housing market in the fourth quarter of 2017 shows property values appreciated 12.7 percent citywide compared to the year before, underscoring just how strong Philadelphia's real estate market was last year. Some individual neighborhoods, according to Gillen's data, however, did not see gains as strong as the city's reassessments show. In South Philadelphia's Point Breeze neighborhood, for example, where the median assessed market value for single-family homes jumped 43 percent, the market realities were less severe, Gillen's data show. According to Gillen's fourth-quarter data from 2017, the median price of a single-family home in the 19145 and 19146 zip codes — both of which include parts of Point Breeze — increased 24.4 percent and 20.6 percent year-over-year, respectively. At a hearing last week, Council President Darrell L. Clarke pressed Piper: Were previous assessments inaccurate? Piper said that prior-year assessments were accurate and that the office is simply improving them. "That answer held no water for me," Clarke said following the hearing. "The property values haven't increased 11 percent in one year; that's ridiculous." Frustration abounded among Council members last week, offering perhaps a hint of political difficulties ahead for the mayor. "It's going to be devastating," said Councilman Kenyatta Johnson, who represents Point Breeze, of his constituents' new assessments, to be mailed this week. "I believe it's a way to juice up revenue for our general fund, and at the end of the day it's the people who have to pay for this increase in taxes … which is primarily low-income and middle-income families." City finance director Rob Dubow said that the city has several relief programs to help low-income homeowners. In addition, the Kenney administration is proposing increasing the homestead exemption from $30,000 to $45,000, which allows homeowners to deduct the homestead amount from their value for property-tax calculations. The administration said that if the homestead exemption were increased to $45,000, some homeowners in areas with decreases or relatively small increases in median value would get a property-tax cut. Piper said that people who think they have a wrong assessment may appeal. One resident who is already planning his appeal is Paul Fiorello, who along with his partner purchased a recently flipped rowhouse near Fourth and Tasker Streets in 2016 for $275,000. The couple considered themselves lucky for the last few years when it came to property taxes. Their home was severely undervalued at just $54,300, meaning they were paying $800 in taxes annually. When the city reassessed their property this year, it quadrupled in value to $272,300, making it an anomaly on the block. Along the entire street, the median market value of homes increased 31 percent, going from $137,500 in 2018 to $180,700 in 2019. The city attributes Fiorello's large jump to the recent rehabilitation of the property. "I totally understand increasing market value — property values are going up and the city needs to pay for its services for residents," Fiorello, who is a real estate agent, said. "But to increase it so much in one fell swoop does not seem fair." Correction: This story has been updated to reflect that new tax assessments will be sent to Philadelphia homeowners this week. A previous version said 2019 tax bills also were being mailed.